While the number of hours of sleep a person needs varies depending on individual needs, a good night’s rest has many beneftis. 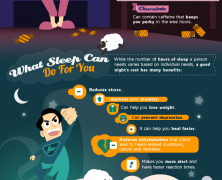 Find out how to bring quality to your sleep and what are the risks of sleep deprivation. Napping is good! It helps brain and body to reboot during the day routine. Learn about the facts, the science and the history on this sheet. Don’t overdo it please.